A Timed 5K Run on the South Shore Riverfront Trail. Prizes awarded to the male and female with the fastest times. Once you’re registered, you may use your personal pledge link to help raise additional funds from friends, family and co-workers to compete for our Top Fundraiser prizes! (No dogs or strollers on this course). A 5K Fun Walk on the South Shore Riverfront Trail. Once you’re registered, you may use your personal pledge link to help raise additional funds from friends, family and co-workers to compete for our Top Fundraiser prizes! (No dogs or strollers on this course). A family friendly walk on the South Shore Riverfront Trail, where dogs and strollers are welcomed. Once you’re registered, you may use your personal pledge link to help raise additional funds from friends, family and co-workers to compete for our Top Fundraiser prizes! 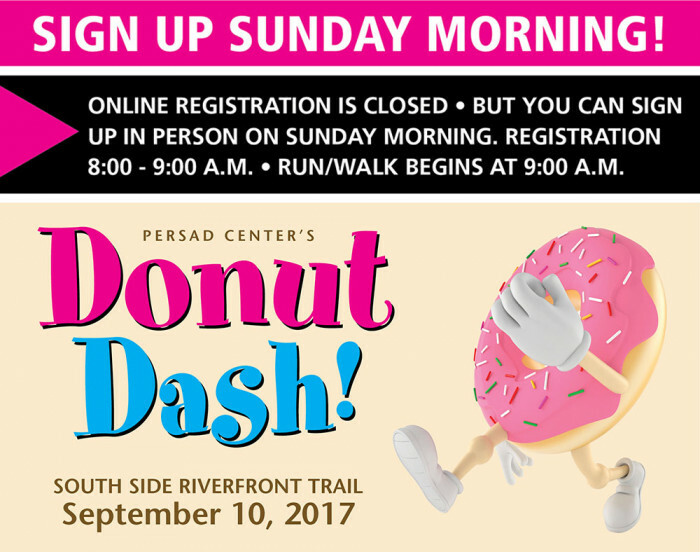 No need to run or walk when you support the Donut Dash as a Virtual Runner! Even if you can’t join us on the trail, once you’re registered, you may use your personal pledge link to help raise additional funds from friends, family and co-workers to compete for our Top Fundraiser prizes! WIN CASH PRIZES &amp; MORE! We want to reward you for helping to raise money. Raise $1,500 – Receive $300 Cash Prize! Raise $2,000 – Receive $500 Cash Prize! Everyone is eligible to win one of the prizes in addition to the sweatshirt. Prize is based on which you level you reach by the start of the race. The top two fundraisers will also be recognized at the race with a fun donut themed award so the world will know what great accomplishment you have done. September 10 8:00 AM EDT - DONUTS & COFFEE!